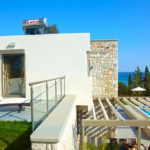 [postimg] Looking for a luxurious yet affordable 3 bedroom holiday villa in one of the best spots on the Greek islands? The brand new (constr. 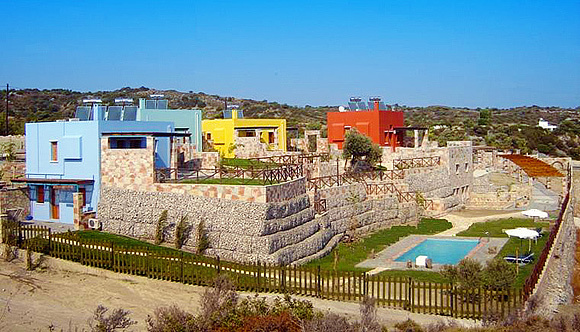 2011) Pefkos Exclusive Villa, located at just 5 km from the magical Lindos, is a fantastic accommodation for your holidays on Rhodes. 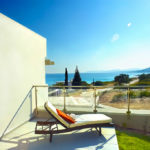 At only 200 meters from the sandy beach of Pefkos, the villa consists from 3 bedrooms, 2 bathrooms (one ensuite, one with Jacuzzi bathtub), and one wc. 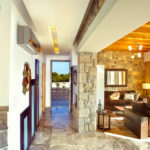 The large living room has a fire place and access to large veranda overlooking the private pool. 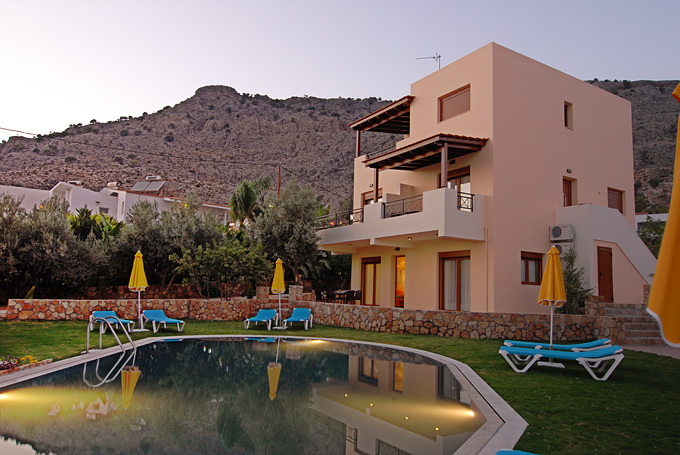 This Rhodes holiday villa can provide accommodation for up to 6-7 persons. 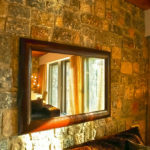 The interior of the living and sitting room is decorated with natural stone, marble , wood and a beautiful fire place. Furniture, lighting and decoration is of the highest standard and specially selected to create an atmosphere of intimacy and familiarity for moments of warmth and relaxation. There’s an LCD HD TV set with satellite receiver, DVD player, music system and air conditioners (use of a/c is included in the price). The living room opens to the kitchen and an internal staircase leads to the three bedrooms. 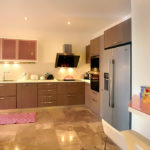 The luxury Italian designed kitchen is equipped with Siemens home appliances including microwave, oven, cooker, dishwasher, washing machine, a big fridge/freezer with ice maker, coffee maker, kettle, toaster, mixer, grill/sandwich maker and blender. There is a full set of cutlery, cooking utensils and glassware. In the storage rooms you will also find an iron, ironing board, first aid kit and sewing box. 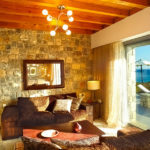 The Rhodes holiday villa Pefkos Exclusive has three double bedrooms. 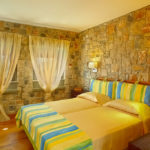 Two of the bedrooms have twin beds and one has double bed. The brand-new quality mattresses provide maximum comfort. A safe deposit box keeps your valuables secure. 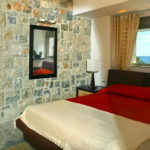 There are spacious fitted wardrobes and a hairdryer in each room. 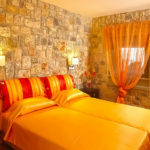 All bedrooms are equipped with LCD HD TV sets with satellite receiver. 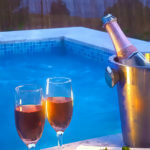 The villa has two bathrooms, one ensuite to the master bedroom with shower room and one with Jacuzzi bathtub and one WC. 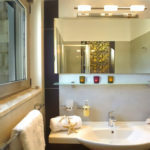 All bathrooms are decorated in modern style. 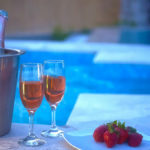 The Rhodes holiday villa Pefkos Exclusive has a private pool with mosaic tiles and hydro massage jets that makes it a unique experience for your summer holiday. 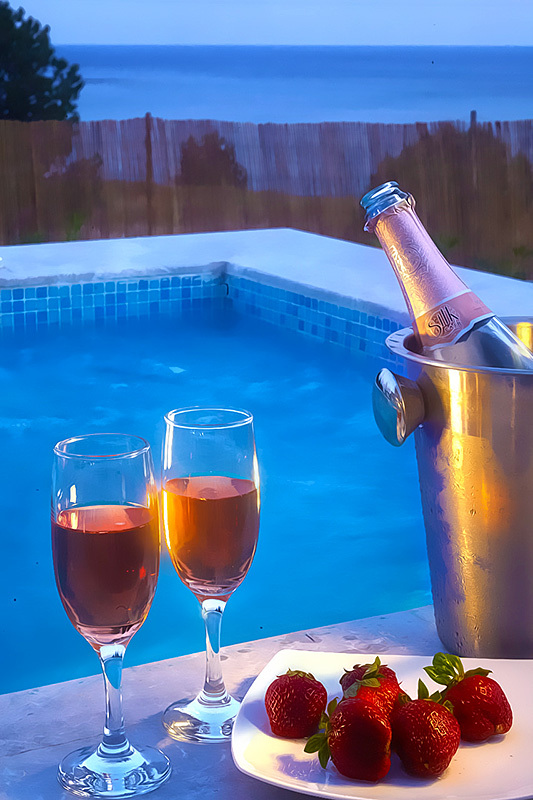 Relax while drinking your cocktail in the pool overlooking the stunning sea views or enjoy the sunset while having an al fresco dining experience.